Editorial | Khader Adnan: His dignity. Our shame. 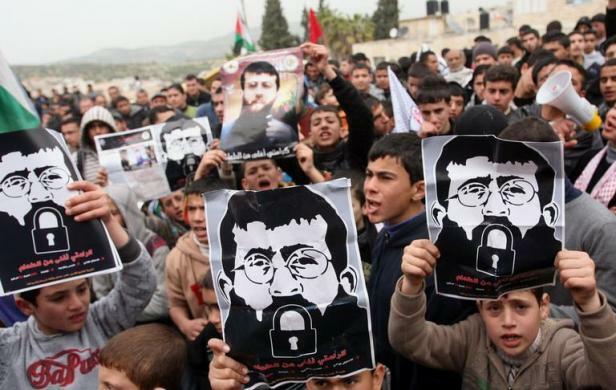 This week, Khader Adnan entered his third month of a hunger strike against his unlawful detention and mistreatment at the hands of the Israeli military.The deafening silence by world leaders and media at his plight shames us all, says Hicham Yezza. Somewhere in the Middle East, a 33-year old man is today (20th Feb) entering the 65th day of a hunger strike. He is currently lying – as he has done for weeks – with one hand, and one leg, shackled to his hospital bed. By the time you read this, he could be dead. Of course, had he been an Iranian opposition journalist, or a Cuban dissident, or a detained Israeli soldier, his name would be plastered across your evening news, his face, and that of his pregnant wife and two young children, ubiquitous on front pages and news websites. Cameron, Sarkosy, Obama, Ashton, Clinton and other human rights specialists would be queueing up hourly for their turn to grandstand and hyperventilate about his cruel treatment, about the need to “do something” to help stop an unspeakable crime from happening. Unfortunately for the young man, he is Palestinian and, unless you happen to be an activist, chances are his face, and his name, Khader Adnan, will be news to you. Adnan, a baker, economics student, and political activist in the Islamic Jihad movement, was arrested at his home by masked Israeli soldiers on Dec 17th 2011. He has been detained without charge ever since. This in itself is hardly novel; tens of thousands of Palestinians are routinely subjected to “administrative detention”, a practice that contravenes most basic tenets of the right to fair and due process. The difference, this time, is that Adnan decided to say “enough”, and to pay whatever it takes to prove he means it. Indeed, “whatever it takes” is increasingly likely to mean Adnan will pay for his stance with his life. A day after his arrest, he began a hunger strike in protest at his detention and ill-treatment. Almost a month later, on January 8, 2012, he was given a four-month administrative detention order, which he rejected and appealed immediately. A few days ago, on February 12th, an Israeli military court rejected his appeal (lodged from his hospital bed). Adnan’s appeal statement provides chilling details of the inhumane and degrading treatment he had sustained at the hands of the IDF, including being repeatedly interrogated, whilst shackled to a chair, and subjected to threats to himself and his family. Adnan insists he will maintain his hunger strike unless released or charged. The court insists on doing neither, ordering him to remain detained, without charge, until May 8th. A death sentence in all but name. The military judge in charge of the appeal, blissfully unburdened with any moral qualms about wilfully sending a man to his death, blamed Khader for his “choice” to continue his hunger strike. Similarly, until a few days ago, the international media, including the BBC, CNN and Al-Jazeera, had little time for Adnan, the longest Palestinian hunger striker to date. There have now been some breaches into this wall of indifference, but only as a result of immense pressure from activists and concerned citizens from around the world, incensed at their leaders’ shameful averting of the eyes away from this unfolding tragedy. Thankfully, many of those who know what’s at a stake have refused to keep quiet. Tommy McKearney, a former member of the IRA – and who had spent 53 days on hunger strike in 1980 – sent a video message of solidarity with Adnan. Over the past few days, hundreds of Palestinian prisoners have launched their own hunger strikes to show their support and appreciation for Adnan’s bravery and determination. Of course, Adnan was from the start fully aware the Israelis would be happy to leave him to die, defiantly proclaiming he was “dying to live”. What he might not have been expecting, however, was that the rest of the world would choose to look the other way. It is not too late for us to save his life, and our dignity. Sign Amnesty’s petition to demand the immediate release or charging of Khader Adnan and other Palestinian prisoners, and the ending of the practice of administrative detention. For more information on Khader Adnan visit http://samidoun.ca/ or join the Facebook group. [*Update 17/02: Ashton’s office has released a statement calling for “Israel to do all it can”. In other words, washing its hands of the matter]. inspired with the courage of adnan….. May allah keep him safe. What is his present update? Like Bobby Sands, Khader Adnan resolves to wire shut his jaws in protest, refuses to eat. What power in that simple act! What resolve! I reject the actions of the State of Israel, which claims to act in my name and in the name of Jews everywhere, and will be joining with many others in New York City this Monday, February 20, to demand that Israel either charge Khader Adnan or set him free.